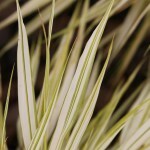 A compact, perennial grass with variegated green and white leaves that form a weeping mound. Leaves flush to a rosy-pink in fall. Prefers moist, well-drained soil in light shade. 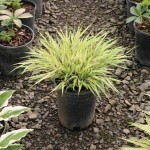 Combine with Hostas and ferns as they have similar requirements. PP 21,757.